By any standard the hitch from Frankfurt to southwest Hungary was a disaster, definitely in the Bottom Ten ever, but it was a true adventure and I have some satisfaction in making it. I just wish it hadn’t lasted 28 hours. I have some excuses for the hitchhiking horror, none of them worth fleshing out that I am in the mood to defend right now (not being fully prepared, without my little USA flag, a tired face, etc.) but maybe the bad omen was that my first ride sideswiped a car at the gas station as we arrived. The aftermath of that was interesting. We scraped a parked SUV and the drivers, an old man and a young woman, get out, softly mutter some small talk to each other, and start to exchange info. I was waiting for an explosion of anger, but it was civil and business-like; no recriminations, no emotion. The other thing of fantasticosity at the gas station was the toilet. I had only seen this once before. 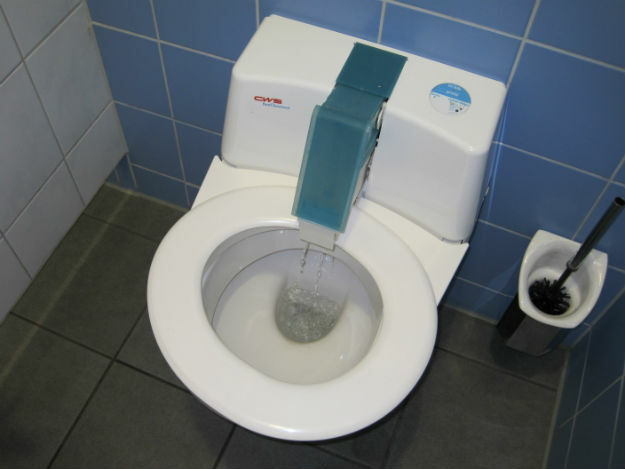 You flush and the seat rotates while the gizmo pops out and cleans it. I assume the Japanese invented it. I will put video on my toilet photo spectacular page. I can only wonder what kind of freak the other person in the bathroom thought I was when the flash from my camera lit up the room. Did I mention that I don’t have a girlfriend? I waited a long time to get out of there, but made it 200km down the road to Nurnberg eventually, and then I really perished. Several people stopped, but they were going the wrong way. I was stuck so long that twice police came over to check my passport and me out. When they start thumbing through all the pages I get impatient as I know I am going to be there for a while; anyone seeing me with the police isn’t picking me up. The second set of police were undercover. One had a huge colored tattoo on his neck. Was he really a cop? I asked to see ID, but anyone can make a fake ID, and I didn’t like handing over my passport to two guys in a car. The passenger did have a custom computer set-up which lent some authenticity, but I can see myself getting bamboozled. What could I do? How much could I push it? The best question might be if someone with such a tattoo would get hired in any American police department. I can’t remember ever standing in one place for 5 hours before. 5 hours! Normally I would be more proactive and do something to change my luck. 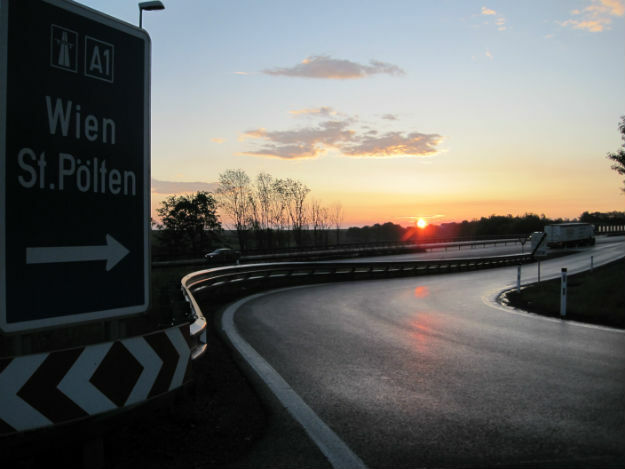 I was dying of tiredness, hunger and frustration while contemplating my options should I get stuck in Bavaria for the night, and despite a view choice words that were yelled skyward, the funny thing about hitchhiking is that I never lose hope. I am relentlessly optimistic. A big, stout Serbian named Slobodan picked me up. You don’t meet people like Slobodan anywhere else outside of hitchhiking. He was a boisterous, loud guy, approaching buffoonery, who by way of introducing himself said he had an IQ of 152. I had barely sat in his car when I was given some bread and some fantastic homemade spicy salami of which I made no pretense of being polite and savored lustily, I was so starving. Slobodan became drowsy. I thought he would stop and rest. He had already said, “Kent! Let’s stop and stretch our legs and eat canned meat!” but he wanted to keep going and talk instead. He couldn’t hide his disappointed that I wasn’t going to entertain him for the next hour with stories of my conquering the entire rainbow of women, but he was quickly on to something else. “Kent! Smell this!” and he put a big bottle of cologne to my face. I took a whiff and thought all my nose hairs would fall out. It was like smelling salts. “Strong,” I coughed, my eyes watering. Then the obligatory Amsterdam red light district story comes out, and after he spent a lot of time analyzing each girl in the windows and discovers the one for him is Bulgarian, it only proved to him that Balkan girls are the best in the world. This was followed by another five minute interrogation about why I don’t marry a Serbian girl. Slobodan was upset at his two sisters who had managed to move to Toronto for not helping him get out. For him it was easy: he said he’d divorce his wife (and presumably abandon his kids) to marry anyone in Canada they could come up with, but to his consternation the sisters didn’t want to go along with the plan. I laughed. “No, man! I will die!” but my protests probably only confirmed to him that I was a sissy. I approached a stern waitress who knew my question before I got it out of my mouth. I asked if I could order some food and stay a few hours, but her demeanor changed in an instant and she sweetly said I could sleep in a corner booth in the back of the restaurant without ordering food. I thanked her profusely and ate anyway. Sleep was tough to come by, and at 5am I was back on the road, still a substantial distance from Hungary. Normally I avoid trucks as they drive too slow, but in my dozy state I wasn’t feeling picky and I got a Hungarian trucker to take me. He was a young guy who was so excited to tell me what he was carrying he could barely contain himself: “Salt!” he exclaimed, and made a can-you-believe-it? look. “24 tons!”, he said, shaking his head. More rides followed through pretty Hungarian back roads. This time of year in Europe the rapeseed crop makes the countryside a brilliant yellow, and there were colorful patches of wildflowers to ease my mind over the events of the past day. There was a random police checkpoint stop with two attractive policewomen packing heat on the bucolic edge of a village. I could imagine the trouble if Slobodan was with me. The penultimate ride was a big fat Mercedes driven by a young musclehead with an enormous neck and lots of gold chains and then, fittingly, given my wretched condition, the 10th and last ride were two off-duty ambulance drivers who took me straight to downtown Zalaegerszeg, the perfect finale. Hilarious story; probably better to read than to have survived!! Reminds me of taking a ride in a Land Cruiser from Somaliland to Djibouti; only 10 hours late on arrival, and slept for an hour in freezing temperatures beside a flooded river, waiting for dawn. I shouldn’t have read this. Now you got me all fired up on the idea of hitch hiking. Imagine the glamour granny in her heels maybe getting a ride with a red man. Wouldn’t that be a story to remember? For now, I’m afraid I’ll just have to invent it. i love hitchhiking!!! you meet the most amazing people that way…as evidenced by your story here 🙂 we met some great people hitchhiking in rarotonga- but you can cover that whole island in 20 minutes 😉 love your writing style- funny stuff! Thanks for your message Kent. I saw your blog on TBX and I’m sure others will too. I’ll suscribe to it, I like your style. Glad to hear that you are going to visit Jordan. Look at my posts and if you need any more info, just holler. Best story I’ve heard for ages lol. I once got a lift with a slightly aggitated palestinian. After I told him I was Irish, he showed me his gun (he did’nt mind the mess when i wet myself) and brought me home to his bewildered mother, who insisted on doing my laundry, which wasn’t pretty after the gun insedent! Truly wonderful people who opened there home, hearts and washing machine up to a sole traveller! Hey Kent, love the posts. Once was picked up by a Dutch Reformed Church minister and a few rides later by a diamond smuggler on his way to pay his lawyer with uncut diamonds to carry on the fight for his innocence in his IDB case. Both were hilarious and poles apart in demeanour and outlook. In northern Sweden, just south of Skelleftea I was picked up by a 74 year old woman at a round-about where there were extensive roadworks and nowhere else to stand. She was amazing and could really drive her little car. And my favorite French family who picked me up just south of North Cape in Norway and pampered me for 5 days. Wonderful people all. Hitch hiking is a way to step out from the comfort zone, experience what is also a reality for millions, and to re affirm some propper values in ones life. Thank you for an amazing site Kent…you seem to have a wisdom that deserves sharing.